The fish declines are linked to a combination of factors, including poor ocean survival conditions, warming river temperatures and agricultural water withdrawals. The Fraser has no major dams. Fraser River chinook, one of the most important food sources for southern resident killer whales, are in steep decline and should be listed for protection as an endangered species, a Canadian independent science committee has announced. The Committee on the Status of Endangered Wildlife in Canada, an independent advisory board to the Canadian federal government, issued a grim list of species at risk of extinction this month. Among the animals are some of the most beloved in Canada, from its biggest bear, the polar bear, to its biggest salmon — chinook. The decline of chinook in the Fraser and its largest tributary, the Thompson River, over just three generations is so steep some runs are at historic lows, others have dwindled to just a few hundred fish, and others cratered by more than 50 percent. The news comes as southern-resident killer whales are battling extinction in part because of lack of adequate prey. Chinook salmon are the most important part of their diet during much of the year — and Fraser and Thompson river chinook are crucial eating for the whales in the summer time. “This is a big deal,” said Brad Hanson, wildlife biologist at the Northwest Fisheries Science Center in Seattle, who among other scientists has extensively studied what the orcas are eating, when, and where the fish came from. Fraser runs have been depressed for years. What is new is the depth of the decline, and how many runs are in trouble. The committee assessed 13 of the 16 populations of chinook salmon as at risk: eight as endangered, four as threatened and one as special concern. All will be considered for listing and protection under the Canadian Species at Risk Act. John Neilson, an independent fisheries scientist based in Comox, B.C., co-chaired the marine fish subcommittee of the advisory panel. He said the Fraser and Thompson river declines are linked to a combination of factors, including poor ocean survival conditions, warming river temperatures and agricultural water draws from the rivers. The Fraser has no major dams. Upper Fraser chinook are particularly important to the southern residents because of their bigger size. However, the run has declined by 49 percent over the last three generations, or 12-and-a-half years, and now is at risk of extinction, Neilson said. The Committee on the Status of Endangered Wildlife is an expert scientific advisory group established under the Species at Risk Act to assess the status of wildlife in Canada. The committee’s status assessments are based on reports prepared by independent experts, informed by scientific research, as well as community and indigenous traditional knowledge. Following a committee assessment, the Canadian federal government must determine whether to list that species for protection under the Species At Risk Act, in consultation with multiple communities and organizations to consider the economic and social implications of a listing. Some said protection is long overdue. Department of Fisheries and Oceans Canada (DFO) is already moving forward with measures to support chinook salmon stocks, said Jocelyn Lubczuk, press secretary for DFO and the Canadian Coast Guard. 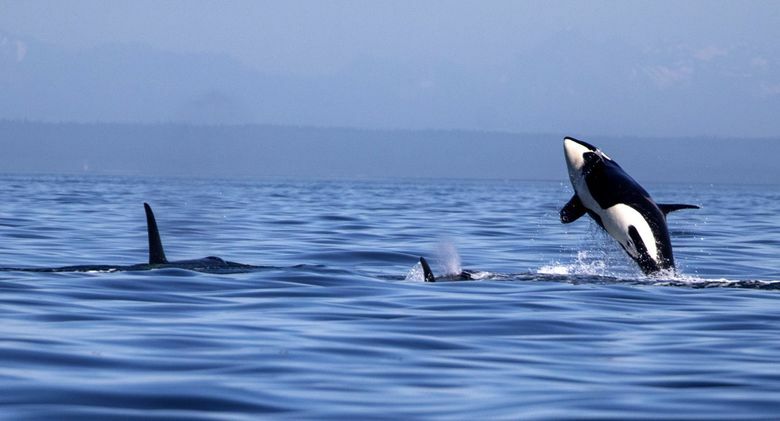 The agency has committed $61.5 million to help southern resident killer whales, including investments to strategically rebuild and protect chinook. To protect endangered southern resident killer whales for the 2018 season, DFO introduced new salmon fishery cutbacks to increase prey availability and reduce disturbance from salmon fishing in three key southern resident foraging areas: the Strait of Juan de Fuca, Gulf Islands and the mouth of the Fraser River. Additional measures implemented in 2018 are intended to reduce harvest of chinook stocks by 25 to 35 percent in northern and southern B.C. Canada also this month announced it will work with the provincial government to create a British Columbia Salmon Restoration and Innovation Fund. The federal government will contribute over $100 million over six years, and the provincial funding will be announced in the coming months. The government is also proposing to make a one-time contribution of $5 million to the Pacific Salmon Endowment Fund. DFO and the Parks Canada Agency also this week expanded critical habitat for both northern and southern residents.